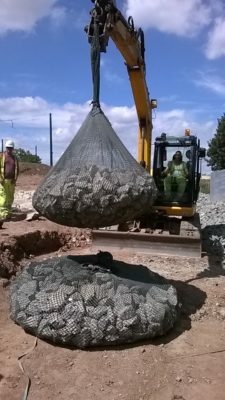 Ridgeway provided Vinci Construction with a range of filter units (1, 2 & 4 tonne) for scour protection of a flood wall on a NET tram project. The tram line located in Nottingham passes a flood storage area that experiences various levels of water annually. Ultimately this required scour protection at the base of the flood wall to protect it from erosion and possible undermining. 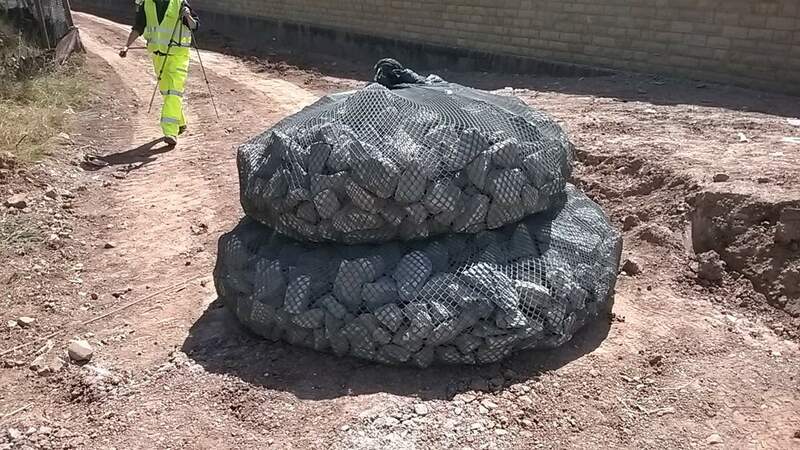 This is the first time that the 2 tonne units have been filled with 1 ton of stone and adjusted to represent a 1 tonne filter unit. Consulting engineers Mott MacDonald designed the filter unit system into the plans as their client wanted a system that would support the growth of grass, giving it a natural river bank finish. The filter units were installed in a step up formation with the 4 tonne unit at the base followed by the 2 tonne unit and finally they were topped with the 1 ton bag. Once the 1 Ton bags were in place, the filled units were covered in soil and sown with grass to allow vegetation growth giving it a more natural look when the water in the flood storage area is low. The filter units were filled with a locally sourced stone providing a porous structure allowing vegetation to flourish. Vinci Construction said they were very surprised at the versatility and simplicity of the filter unit, not just during installing but also it’s fast production.